"Dealing With Difficult People" author event Sat. February 6th! 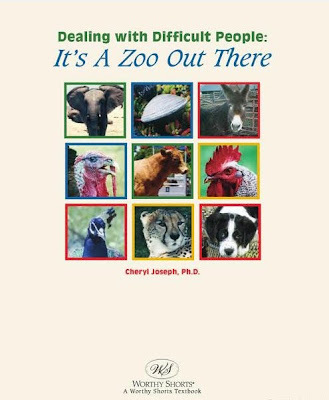 Florey's Books invites you to meet local author Cheryl Joseph as she discusses her book "Dealing With Difficult People - It's a Zoo Out There"
Ever feel like you have been attacked by a lion, poisoned by a viper, or confronted by a mule when you haven't even left home turf? If so, "Dealing With Difficult People: It's a Zoo Out There" is the book for you! Let's face it: whether it is your boss; teacher; spouse; coworker; parent; or best friend, people can sometimes be beastly. Written by a sociologist with many years in the corporate world, as a university professor, and a lover of animals, this book explores effective communication techniques by tenderly and humorously comparing stereotypic behavior of various animals to that of challenging people. Brimming with insight, this book also contains many attractive and colorful photographs of the animals it discusses, making it as enjoyable and fun to read as it is useful in any social situation where difficult people lurk. Look for an interview in the Feb. 3rd Pacifica Tribune! 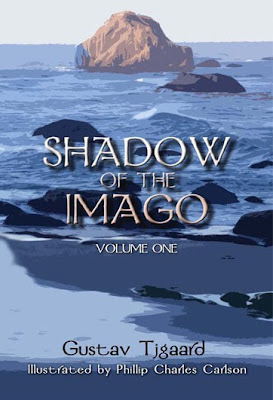 "Shadow of the Imago" author event, Saturday, January 23rd! Florey's Books invites you to meet local author Gustav Tjgaard as he discusses his new book "Shadow of the Imago". This book is a memoir of Simon, of an adolescent year in the Arcadian San Juan Archipelago of Puget Sound, a northwestern version of the Greek Aegean. Simon, a pubescent Odysseus, matured in this islanded environment of boats, fishermen, sailors and yachtsmen, all drawn to his father’s boatyard by their common love of the sea. Soon into the story Simon begins to appreciate the attributes of Zoë, a blond nymphet of Swedish extraction. Together they learn something of sailing and something of life. Yes, even in the primordial 1930s some teenagers were tempted by Eve’s apple, and yes, Zoë and Simon savored a bit of that pome. The carnal appetite of Simon’s father brought their fledgling love to a catastrophic denouement. The relationship deteriorated into a circumstance that resulted in Simon being exiled as a ship’s boy aboard a lumber schooner engaged in the China trade. Born on Decatur Island of the San Juan Archipelago of the State of Washington. Served as a sailor, in trade with the Orient, on the last and largest Windjammer (Vigilant) to sail commercially. Was a para-trooper in Europe during WW II. After the war, he took a degree in mining at the University of Alaska's School of Mines. He later lived and worked with the Tlingets in Alaska. Look for an interview in the Jan. 20th Pacifica Tribune! 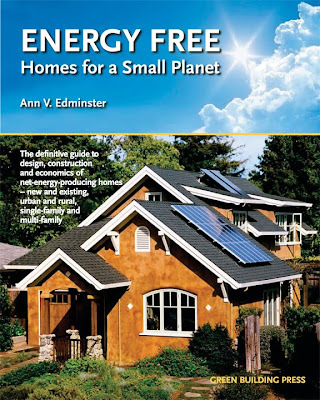 "Energy Free: Homes for a Small Planet" book event, January 9th! Homes for a Small Planet". Individuals and institutions have been working toward "zero-energy" homes for decades. This volume is the first record of those collective efforts, distilling their experience into a practical and comprehensive how-to guide. The author includes resource information and step-by-step guidance on how to make decisions that will yield an energy-free residential project, whether a single-family home or multifamily building, new or existing, in an urban or a rural setting. The unique needs and opportunities of each context are addressed. Ann Edminster, M.Arch., LEED AP, is a recognized national expert on green home design and construction. She is a principal author of the LEED for Homes Rating System and consults to builders, homeowners, developers, supply chain clients, design firms, utilities, investors, and public agencies. She sits on the advisory boards of several private companies. Look for an interview with her in the Pacifica Tribune this week!